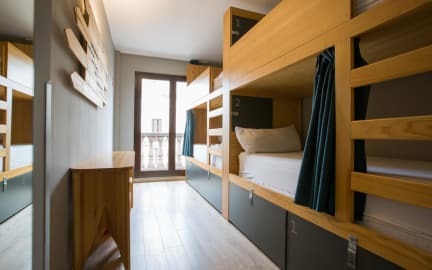 Yeah Hostel Barcelona kohteessa Barcelona, Espanja: Varaa nyt! Super clean, fun staff, felt safe! A perfect hostel! The rooms were great and clean. If you are travelling alone and wanna meet people, this is the perfect place for it! Met so many amazing people on the dinners that the hostel organizes every night. Thank you for a great stay, I will be back! The hostel was quite OK. Tidy and quite centrally located. Pleasant staff and nice breakfast. However, the dinner was TERRIBLE. Vegetable stock served as first course and undercooked beef stew for main course. We didn't stay for dessert. The food was not only bad but unprofessionally prepared.